Individual character modern country house. An individually designed 4 bedroom detached character modern country house enjoying an exclusive peaceful and private location within the heart of this charming period Thameside village. Situated at the far end of a tree-lined private access lane, adjacent to a small conclave of mixed modern and period properties. The property has undergone a tasteful and luxurious modernisation programme of recent times and was constructed to a high standard of brick under a tiled roof some 30 years ago. Whitchurch-on-Thames has long been noted as one of the most exclusive and sought after Thames villages and Ebony is within easy walking distance of the River Thames and the vibrant period village of Pangbourne with its specialist shops, station, pubs and restaurants. 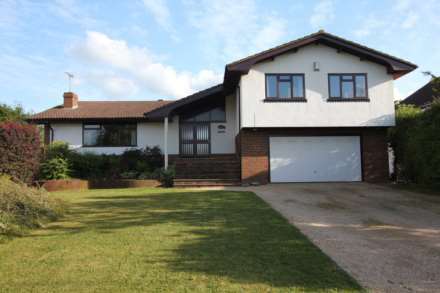 The property is also within easy walking distance of the highly regarded Whitchurch Primary School. Summary of accommodation: Large reception hall, sitting room, dining room, cloakroom, kitchen/breakfast room, utility room, 4 bedrooms, family bathroom, ensuite shower room to bedroom 1, detached office, full gas fired central heating, double attached garage with access to utility room, heated swimming pool (30` x 15` graduating from 3` to 7` in depth) with a gas fired boiler. Gardens and grounds: Front garden is entered by a wide gravelled drive secured by high painted timber gates with a large gravelled car parking area, high hedges giving seclusion, side access to the rear garden. Rear gardens; mainly laid to lawn with herbaceous borders a wide large stone laid sun terrace running the width of the property with plenty of room for summer dining/BBQ area. Local facilities: Ebony is within easy walking distance of Pangbourne village centre with its fine selection of award winning independent shops, a supermarket, health centre, dentists, library, hairdressers, riverside pubs and fine restaurants. The River Thames runs between the villages and has riverside meadows, part-owned by the National Trust, the Thames Path, a children`s play area, tennis courts, football pitches, a bowling club and Pangbourne Adventure Dolphin centre offering canoeing and climbing instruction. Whitchurch-on-Thames also has two fine character pubs in The Greyhound and Ferryboat. Directions: From the offices of Dudley Singleton turn left and left again at the mini roundabout. At the next mini roundabout turn left at The George Hotel, cross over the River Thames toll bridge and enter the village of Whitchurch. Continue along the High Street, passing The Greyhound pub on your right, turn left into Manor Road and a short distance down on the left hand side turn into Old Gardens. Ebony will be found at the end of this private road.